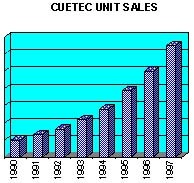 In just seven years, over 350,000 Cuetecs have been sold, surpassing sales of the most popular cue brands. The reason is simple. Cuetec delivers the best value in the market, loaded with features and selling at prices far below custom cues! Cuetec gives you more cue for the money! Each is crafted with a super hard inner wood core for a sure solid hit, then Power-Bonded with resilient layers of fiberglass or graphite. Power against dents, warping and atmospheric conditions which can ruin a cue in a short time. The legendary Cuetec hit, balance, the NEW improved 15 1/2" S.S.T taper, and super-smooth "Tru-Glide" shaft finish deliver results any pro would boast about. Just ask Earl Strickland, Allison Fisher, and many other pros who play exclusively with Cuetec. And you can play with exactly the same cue five-time World Champion Earl Strickland uses for about $150! Available in a large variety of beautiful colors, finishes and unique designs, there's a Cuetec styled to please every taste.